"I loved the 2016 Zinfandel Howell Mountain, and this beauty has everything you could want from a mountain Zinfandel. Possessing a huge perfume of blue fruits, leafy herbs, and cedarwood, it hits the palate with medium to full-bodied richness, silky tannins, and a pleasure-bent, complex, layered texture that just begs to be drunk. It too will keep for over a decade." "A barrel sample, the 2016 Zinfandel sings of crushed blackberries, fruitcake and raspberry preserves notes with touches of potpourri, incense and Indian spices. Full-bodied, velvety, rich and spicy in the mouth, it delivers mouth-filling berry preserves and exotic spice layers, finishing long with some earthy notions coming through." 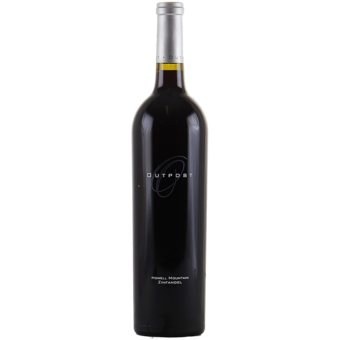 "The 2016 Zinfandel is another superb wine from Outpost. Dark, ample and full-bodied, the 2016 is imbued with tremendous character as well as complexity. Dark cherry, plum, chocolate, leather and smoke all build as this super-expressive Zinfandel shows off its personality. In 2016 the Outpost Zinfandel is outrageously beautiful, not to mention a huge overachiever." "Outpost was established in 1998 with the vision of producing wines that are a living, breathing embodiment of this magical place. Truly one of the world’s great Cabernet Sauvignon and Zinfandel growing regions, the unique terroir of the Outpost vineyards – the hard, rocky red soil, high altitude, gentle cooling breezes and sunny western exposure – produces fruit of incredible intensity and richness, with a distinctive spice you simply cannot find anywhere else. Capturing the essence of the land’s rugged terrain, Outpost creates world-class 100% varietal bottlings of Cabernet Sauvignon, Zinfandel, Petite Sirah and Grenache from our own hand-cultivated, organically farmed 28 acre estate vineyard. We also produce a 100% Cabernet Sauvignon and ‘Immigrant’ red blend, a combination of Cabernet Sauvignon, Merlot and Cabernet Franc, from our 9 acre True vineyard. The guiding principle of our wine-making program is to realize the full potential of these unique pieces of land, to create a living history of vintages with immense character and true sense of place. Under Thomas’ expert guidance, Outpost grapes are harvested late in the season – by hand, at dawn – to preserve the full intensity and distinctive spicy character of the mountain fruit. The grapes are processed with as little manipulation as possible. Grapes from each block within the vineyard are fermented separately so that our winemaking team can be very selective about the lots that comprise the final blend. Wines are neither fined nor filtered allowing for the full expression of the vintages’ potential.